As our bus climbs out from the lowlands of the India-Nepal border into the forested hillside, my senses begin to return. My eardrums stop ringing with Subcontinental clamor, the retinal nerves at the backs of my eyes begin their slow adjustments to the earth tones of the Nepal landscape and my sinuses clear themselves of an eight-week airborne buildup of ground turmeric, baked excrement and exhausted rose petals. Everything in India is festooned, perfumed and amplified. Nature is for adulterating: flowers are for plucking, animals are for decorating and water is for super-saturating. In Varanasi, mango and sandalwood are valued for funeral pyres at three times a corpse’s weight. In Lucknow we met a newly hired environmental communications director with the daunting task of helping deliver on Prime Minister Modi’s stated campaign goal to clean up the Ganges in three years time. 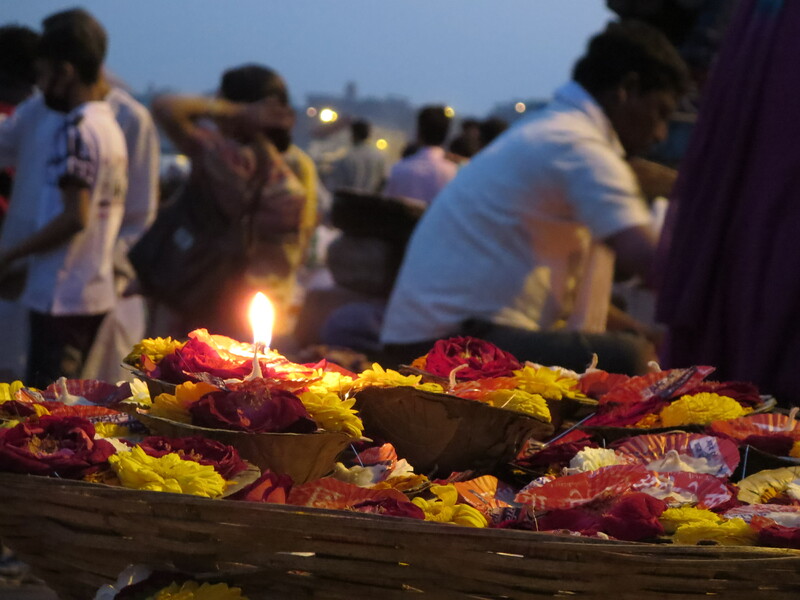 Floating water offerings, Varanasi, India. Here everything is green and brown, and there is a palpable reverence to nature as people live their lives in the shadow of the temperamental Himalayas. Both the visual and physical transitions are jarring. We are jostled into one another and bounced along on our tailbones as the bus driver navigates hairpin turns, water buffalo-sized potholes and oncoming traffic. In India, drivers announce their invincibility with their horns to proactively clear the way. Nepali mountain drivers honk conservatively, courtesy and caution are assumed and blind curve outcomes are left to thrilling chance. There is a sense of uncalculated risk, a flirtation with danger in this cool mountain air and we vow to keep our wits about us. The bus winds its way upward from Tansen through terraced hillsides and rugged hamlets. Sarong-wrapped women carry bushels of cabbages on their backs. Black chickens strut and scratch in the dust along the roadside. Spry, silver-haired farmers crouch and climb, the tendons and skin at the backs of their knees is stretched youthfully taut from decades of life lived on an incline. It isn’t until the next morning in the lakeside town of Pokhara, after a sound night’s sleep aided by heavy rain and blankets, that we see the mountain range. It is unnervingly close, impossibly tall and entirely inhospitable. 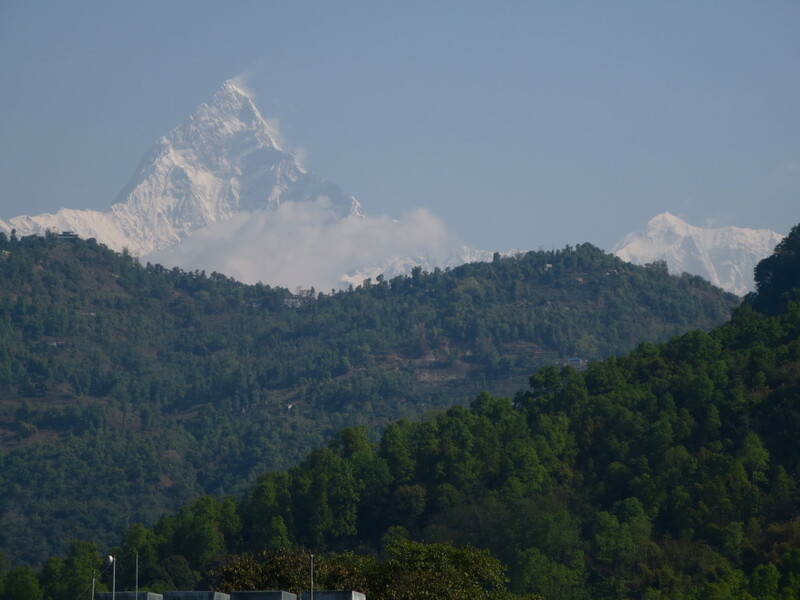 An unfathomably cold wind blows snow off of Machhapuchhre Peak across the sheer blue sky like an incense trail. Cowering in the comfortable safety of a coffee shop and imagining my foot inadvertently slipping from an ice shelf, mountain climbing seems like a form of certifiable madness. Nothing about these mountains makes me want to climb them. To attempt to do so would be a fool’s errand. To attempt to do so would mean certain death. 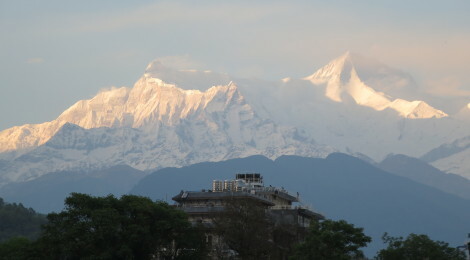 One of the Annapurna massif’s many peaks over 23,000 feet, viewed from Pokhara, Nepal. If you cannot understand that there is something in man which responds to the challenge of this mountain and goes out to meet it, that the struggle is the struggle of life itself upward and forever upward, then you won’t see why we go. What we get from this adventure is just sheer joy. And joy is, after all, the end of life. I study the drift of foam on the surface of my coffee drink and imagine the slumping arc of Mallory’s bleached, exposed shoulder blades and spinal column, frozen in time for seventy-five years on the mountainside until his body was finally discovered in 1999. Later, as I paddle Christopher aimlessly about on Phewa Tal in the afternoon sun as he reads aloud to me, it is clear that Mallory and I follow our bliss down different paths. While I agree that adventure is sheer joy, I prefer wide-eyed circumnavigation to snow-blind ascension. 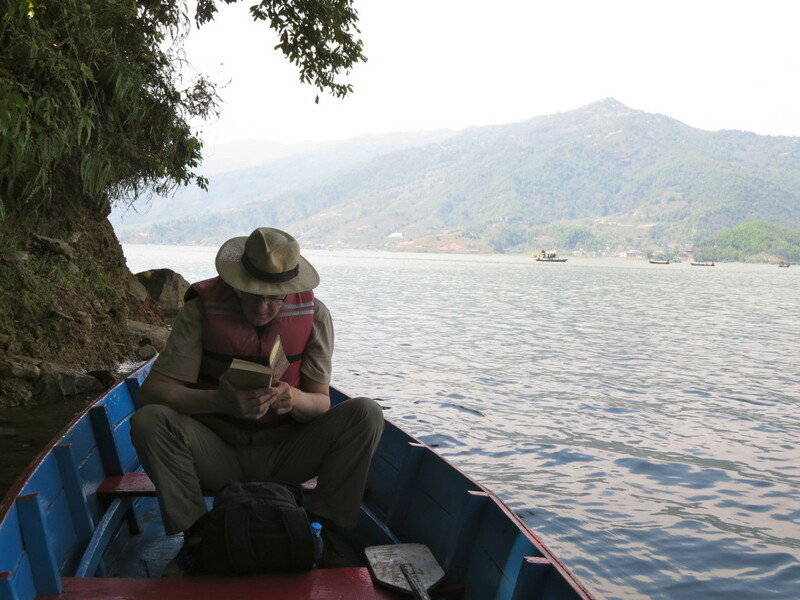 Christopher reads the river scenes from The Wind in the Willows aloud while row boating on Phewa Tal, Pokhara, Nepal. As the sun sets behind the hills, I am reminded again of Varanasi where I sat for hours observing mourners and doms (crematorium workers) burn the bodies of loved ones on the banks of the Ganges under a smoky sky. 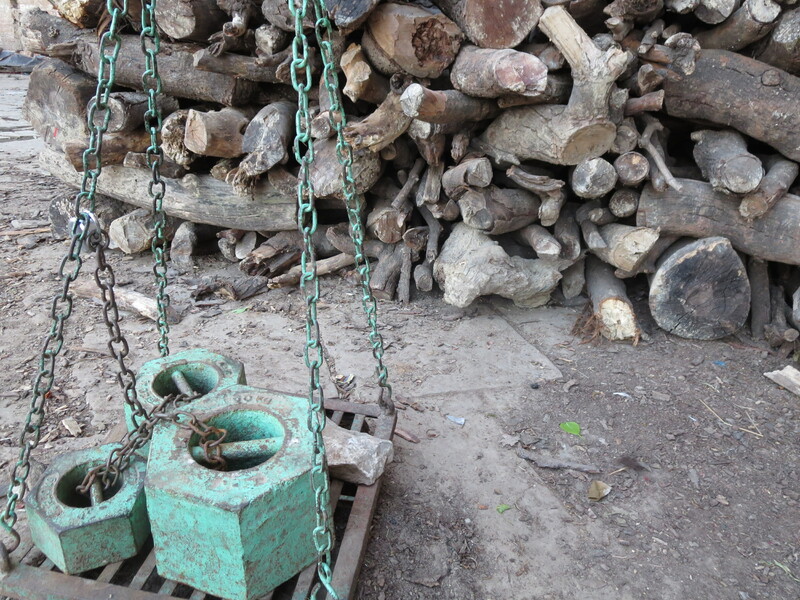 As joints charred and failed in the flames, loose limbs were lifted with bamboo tongs and repositioned in the fires with no more ceremony than campfire logs. There was finality to the cremations, a complete separation of human spirits from their physical shells the likes of which Mallory’s frozen dreams and bones will never experience. Firewood scale, Manikarnika Ghat, Varanasi, India. Hindus take solace in the idea of reincarnation, believing that a soul has many life cycles to mature from the subhuman level up through the human chain of being. With humanity comes consciousness and the freedom to determine one’s actions and future fate. If you are struggling and suffering in this life, take heart: your soul will have countless opportunities to advance and prosper. In the West, motivational posters in high school hallways and office break rooms feature images of alpinists at the summit with slogans daring students and minimum wage slaves to “never give up” and “dream big.” Activewear ads show perfect human specimens scaling cliff faces while sporting the latest in technical fabric innovation. We idolize mountain climbers, borrowing their courage and grit for commercial metaphors and inspiring ourselves to keep reaching higher, working harder and achieving more. Mountaineering is a luxury sport. The average cost to join a tourist expedition and climb Everest in 2015 is estimated at approximately $40,000. Meanwhile, Nepal remains one of the poorest countries in the world. (Read the Guardian’s recent article on the ethics and economics of climbing Everest here.) If the adventure sportswear marketers are right, anyone can climb the Himalayas outfitted with the right gear. If the Hindus are right, after enough lives we may all achieve our personal bests and have what it spiritually and financially takes to climb Everest. If, however, the climate change scientists are right, it won’t matter how scientific our parkas are or how many lives we have left to burn: we’re about to run out of ice. Perhaps blindly taking oncoming curves in the road is something we all have in common with Nepali bus drivers. Perhaps, when it comes to the human response to snow-capped peaks, there is more than one form of certifiable madness. While I wouldn’t slight Mallory or other climbers their aspirations, or the faithful their belief systems, I do wonder about the consequences of this cycle of forever upwardly mobile hero worship. What if viewing nature as something to be conquered, or karmically overcome, is unwittingly encouraging the degradation of the resources needed to support life? What if celebrating arrival at the top, whether climbing icecaps, caste systems or corporate ladders, makes it easy for us to accept fatally flawed systems that catastrophically exploit life at the bottom? What if sheer joy is not, as Mallory wagered, the end of life? What if, rather, it is only through the conscious, wholehearted and successful preservation of life that humans will experience sheer joy? 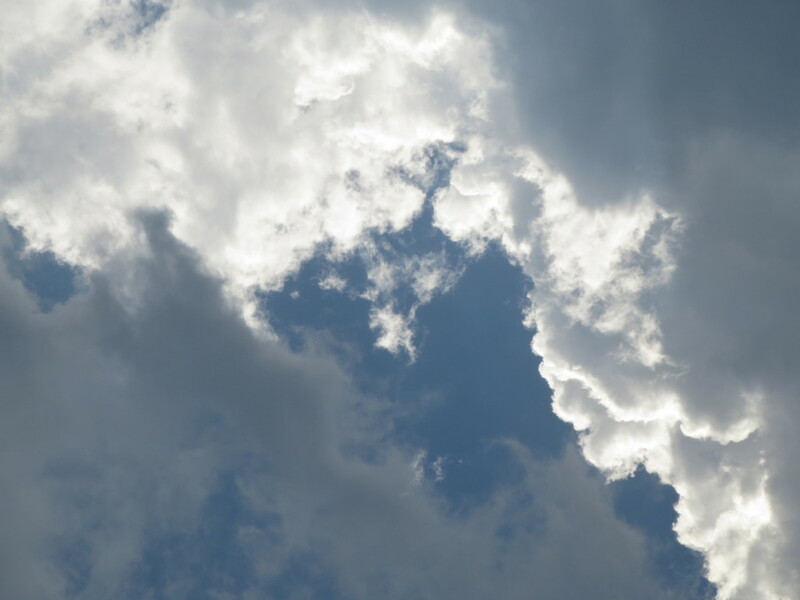 The changing sky over the lake, Pokhara, Nepal. I think you are fighting, or perhaps just observing, human natures response to entropy. The universe has an arrow of time and things tend to run down, get cooler, disperse, age out. You don’t get as much energy out as you put in. Life, and therefore human nature, strives against these properties by building, aspiring, learning, climbing, conquering. These advances come at a local cost in energy and time, you are always stealing (borrowing) something from somewhere in order to stay alive, whether it be food, light, warmth, water, or whatever. We borrow a little so that we can produce a small local peak. To your point, perhaps we are overcompensating a little. We borrow too much and don’t give back enough. However, I think that entropy wins in the end. Wondering about your safety and whereabouts in light of yesterday’s 7.8 magnitude earthquake in Nepal? Please post your status. Wondering the same thing…I’m hoping you both are safe. We departed Nepal at midnight on 4/20/15. Today finds us in Bangkok. We are in excellent condition. We wish we could say the same for Nepal. Alas. 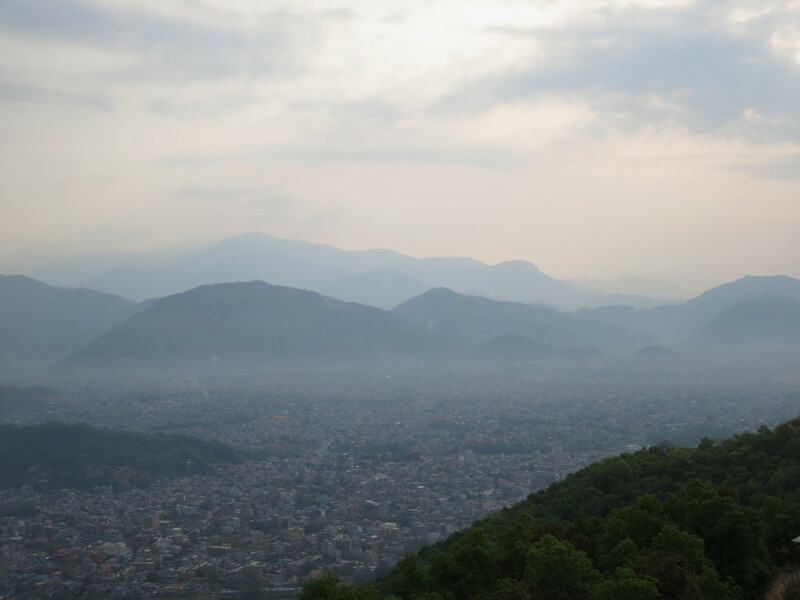 We are struggling with what to write about Nepal, this piece has a couple calls to action.